South Sudan - An estimated 5.5 million people in South Sudan are facing severe food insecurity and malnutrition due to conflict and a collapsing economy. Families’ coping mechanisms are declining as many communities face multiple displacements and reduced access to crops, markets and basic services. The Government of Japan is providing USD 1 million to support IOM’s efforts to mitigate the impact of severe food insecurity on families across South Sudan through lifesaving health and water, sanitation and hygiene (WASH) assistance. The crisis is particularly severe in Unity, where an estimated 100,000 people are facing famine conditions. However, people are affected in parts of every state and many are extremely vulnerable. More regions in the country are at risk of conditions deteriorating into emergency or famine conditions. Widespread lack of safe drinking water, limited access to sanitation and health care facilities and poor hygiene practices have left these already vulnerable, food-insecure populations at greater risk of preventable diseases. Through Japanese support, IOM is procuring critical basic household items to ensure that relief agencies have access to humanitarian WASH supplies. In food-insecure and famine-affected areas, IOM aims to help partners reach an estimated 50,000 people with water storage and treatment supplies, 21,000 women and girls with menstrual hygiene management kits, and 20,000 people through improved sanitation facilities. 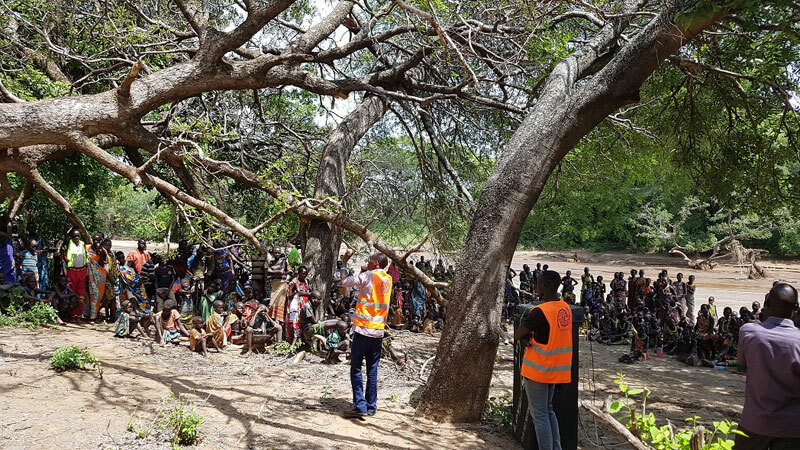 The project also supports IOM’s emergency response and preparedness teams, which are currently in Kapoeta, Eastern Equatoria, where thousands are vulnerable to a cholera outbreak that began in late April. As populations in Kapoeta are facing severe food insecurity, a cholera outbreak can be catastrophic in areas where individuals already experience malnutrition, poor WASH conditions and limited access to health facilities. IOM’s team on the ground is working to increase communities’ access to safe drinking water through borehole repairs and distribution of water treatment supplies, as well as improving hygiene and sanitation through hygiene promotion activities. The Government of Japan funding has also provided a boost to IOM’s rapid response health teams, which are able to react quickly to health emergencies and disease outbreaks across the country. The team most recently responded to a cholera outbreak and acute primary health-care needs in Jonglei’s Ayod County, where families face crisis-level food insecurity. Over three weeks, the team conducted over 3,300 consultations and reached over 8,400 people with health and hygiene promotion messages. IOM’s emergency health and WASH responses are also generously supported by USAID’s Office of US Foreign Disaster Assistance, the UK Department for International Development (DFID), the EC European Civil Protection and Humanitarian Aid Operations, the UN Central Emergency Response Fund and the South Sudan Humanitarian Fund, as well as additional funding from the Government of Japan. For further information, please contact: Ashley McLaughlin at IOM South Sudan, Tel: +211 912 379 793, Email: amclaughlin@iom.int.